Loft extends your living space into the outdoors. Its lift mechanism ensures the large panels are easy and simple to move while providing unparalleled airtightness when closed. Two panel configurations — in lieu of three or four panel — define contemporary lifestyle and breathtaking atmosphere. Safe, durable, easy to operate and energy efficient, this door is the best from Novatech. Consult the installation guide for Urbania and Loft: Download. 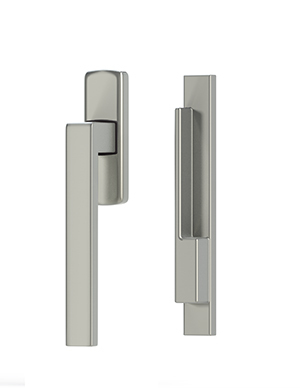 Kora handle in finish: Brushed Chrome, Black et White. Two scratch resistant standard colors. Custom colors available on demand. To learn more about all the options available for Urbania and Loft, please consult the brochure.